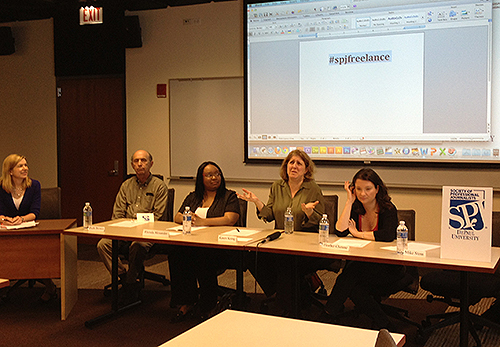 SPJ DePaul hosted a panel discussion with Chicago-based freelance journalists on May 20. Journalists Amy Merrick, Rick Brown, Rhonda Alexander, Karen Kring and Heather Cherone talked to the 25 DePaul students who attended the event about their personal experiences freelancing. The panel answered questions about how they decided to work as freelance journalists, cultivating contacts and jobs, time management, and setting rates. The panel also discussed the perks one must give up in working as a freelancer, including a steady income and developing professional relationships in a newsroom setting. “Freelance is an opportunity to hold onto your career and craft your own destiny,” said Cherone, a freelance reporter/producer at community news site DNAInfo Chicago, as well as an adjunct professor of journalism at DePaul. The hour-long discussion left the DePaul students with more knowledge about the precarious nature of freelance journalism. The panel also reinforced the notion that all journalists must remember: It’s all about marketing yourself and building relationships. Find more freelance resources on the SPJ Freelance page.